We’re not in control of something until we write it down. Shopping lists, written budgets, goals for the year, maintenance checklists, resumes, journals, accounting, systems, blogs…they’re all a form of either expressing or gaining control over our behavior and our lives. Writing things down is really our greatest superpower. It’s uniquely human, because it’s a way of showing separation from our actions and even our own thoughts. It’s the ability to hover over ourselves and watch and change what we do. It allows us to reflect, govern, control, predict, and create our own outcomes. It allows us to transcend time, recording the past and predicting the future. It’s quite god-like in fact. The big gain from writing things down is giving it our attention. When we put our attention on something, we make it better. That’s just how it works. Our brains are thunderously powerful problem-solving organic computers, so once we point it in a direction, it will get busy trying to create connections, looking for ways to solve conflicts, and turning things toward our desired outcomes. So by starting to track something – outside of our brain – we will automatically begin to improve it. If you want to improve at something, write it down. Count calories, track exercise, keep a stress journal, record accomplishments at a job, document how things work in a business, capture bills and spending. Even ‘soft’ things in life improve with a little documenting. Keep track of important dates in loved ones and friends lives, surprise them with a note reminding them of it, and watch how that improves relationships small ways. Plan special weekends, budget for and track exciting upcoming events/vacations, take a (written) note when a loved one says they ‘love’ something, and put it on a shopping list and surprise them with it. Writing things down introduces objectivity. We can all see things better when we’re looking at them from a distance. That’s why we have mirrors in dressing rooms. The root word object is the key. It’s about stepping away from something, an object, that we can then observe and analyze separately. In fact, when the word is used in a different way “Your honor I OBJECT!” we may think it’s a different definition, but it’s not. I OBJECT or ‘throw this away’ or ‘stand apart from this’. When we write something down it becomes an object, something we stand apart from. That’s why it brings clarity. Often we’re surprised when we finally write something down and look at it. We didn’t realize how far off our predictions were, or how big or small it turns out to be, or how often or infrequently we do something. Analysis shows us the mistakes we’re making and often how far off our personal storytelling is from reality. It can be eye-opening, and humbling, but invaluable. It takes courage to look reality in the face, which is why most people avoid it at all costs. Usually the excuse is that it takes too much time (it doesn’t, it saves tremendous amounts of time by allowing us insight into how to focus our time and energy), or that it’s too tedious (it can take discipline and patience, but very little – and less the more we do it). But those are just excuses to avoid looking at our lives and seeing our own shortcomings, and being confronted with having to make changes to improve ourselves. Scary stuff, no doubt. Truth is daunting. The great power built into writing things down and looking at the information is that it allows us to imagine changes without having to learn from multiple mistakes over a long period of time. By reorganizing a shopping list or a budget, or thinking through how to reach a goal faster, we can make these changes on paper (or digitally of course). We can propose changes to our behavior without actually having to change our behavior, and then see how that affects things. What if I buy everything in bulk? What if I exercise for 10 minutes more per day? What if I save 15% instead of 10%? What if I helped this person? This is perhaps the most important and amazing part of writing things down. We can play with it like a model, a blueprint that we can mark up and erase and re-draw, imagining how the result might look. And only then do we take action, with a purpose and a reason. We don’t waste time and energy just going about things randomly, taking guesses as to the effects of actions, unsure exactly how things are related or how things may dramatically change if we made small change in the right area(s). Almost without fail, when we write something down and analyze it, we realize we’ve been making poor assumptions, going about things in completely the wrong way, or at the very least wasting our time. There’s no sense fumbling and guessing through life that way, when a little written information can help us see reality and make more clear decisions with much better results. Don’t let fear do that to you. Often the sentiment is that writing things down in life or business is too regimented. “I don’t work that way” people say. No, only the successful work that way. When we do things in a more “carefree” , non-regimented way, we get poor/average results – often random and difficult to deal with, which means we spend a good portion of our life managing our little problems, decreeing “that’s life” and not finding a moment (actually the courage) to analyze our life and make better decisions. Regimented is an interesting word. The root is Latin ‘reg’, to organize, which means ‘to construct’, or ‘make’. Make has its root in the word ‘fit’, as in to ‘fit life’. So it actually means becoming more in sync, more harmonious with how the world actually works. 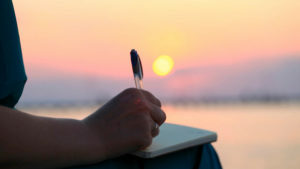 So that’s what writing things down is all about – looking at our own behaviors, thoughts, and actions, and looking at them from a little distance to see how they really stack up to reality, with the aim of better aligning them to get desired results. And given how easy it is to take a few moments to jot down a journal entry, document a change to a maintenance checklist, or update a budget, the rewards are exponential in return. That’s the power of simply writing things down – the power of looking at reality and making decisions that move us effectively and efficiently toward where we’d like to go and the life we want to live. The alternative, the default, is to stumble through a fog of personal stories, poor assumptions, and one-liner decrees about life (“I’m doing my best”) which are not at all true, and ultimately keep us pinned down by life’s challenges. Which sounds like the more free way to live? But don’t take my word for it, try it. Pick anything that you’re having trouble with or dealing with, and start writing it down. Start tracking it, looking at it separately, and see what happens. Watch it improve. Watch your insight grow, and the solution start to emerge, whether directly or through another agent that you never imagined was related. Everything gets better when you simply start writing it down.